Also called laurel leaf or bay laurel, this Mediterranean aromatic herb comes from the evergreen bay laurel tree. The ancient Greeks and Romans attributed magical properties to the laurel leaf, and has long been a symbol of honor and triumph. 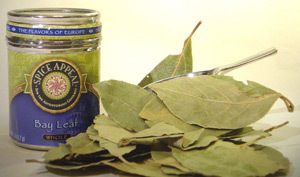 Bay leaves add a strong, spicy and pungent flavor to soups, soup stocks, pickles, meat and fish marinades. Most widely used in Mediterranean cooking, its grassy, sweet flavor adds “dimension” to kebabs, bean blends and bouillabaisse.